Linking up with Nat over at Threads & Bobbins for another #sundaysevens – a blog post containing seven (in theory) photos of your life outside the blog. 1. 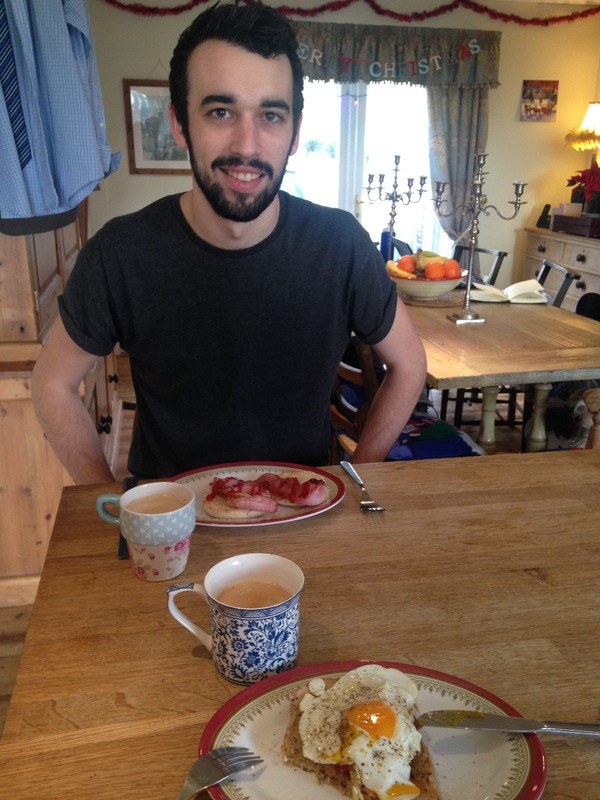 Had a cosy breakfast with No.1 Son who was working from home. 2. 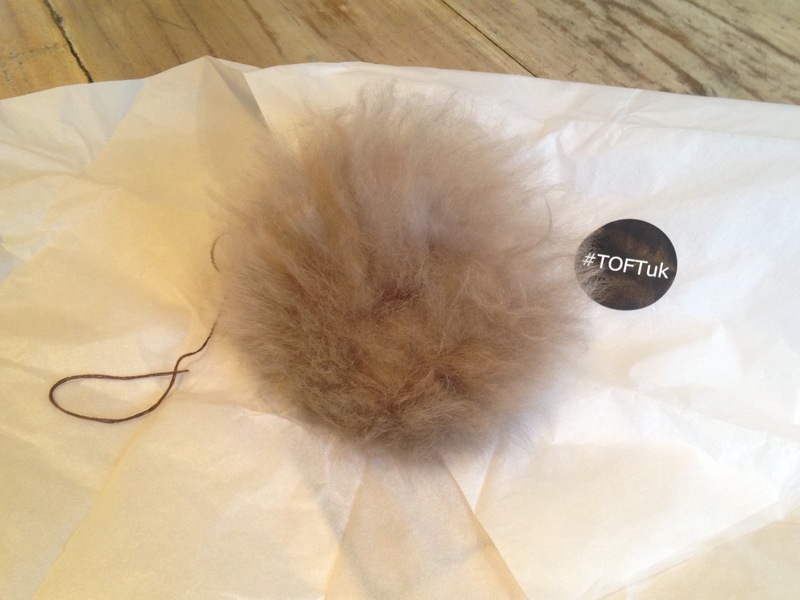 This utterly gorgeous alpaca fur Pom Pom arrived from Toft…. 3…….and this is the hat that it will sit on. 4. I like to make samples in advance of a project for my students to show them what they will be making next and how they can make it individual to themselves. 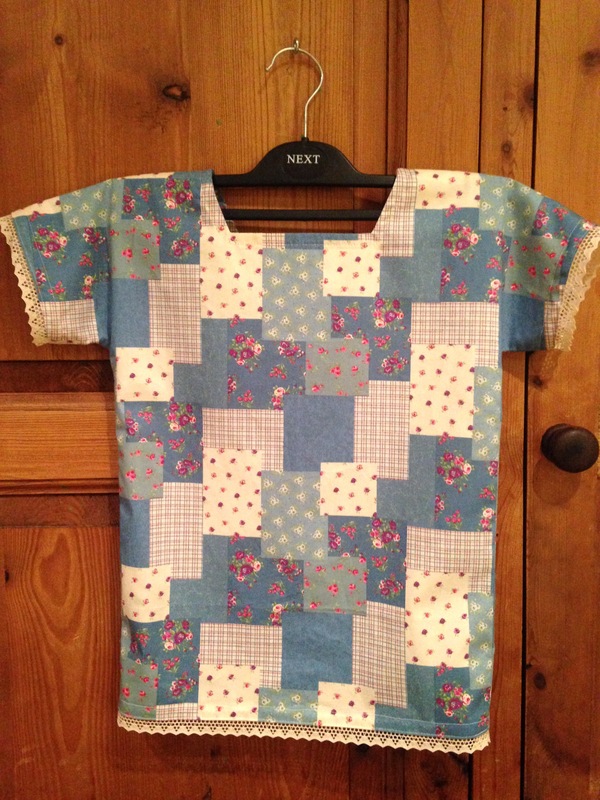 I chose a patchwork cotton and trimmed it with some vintage lace from my stash. 5. 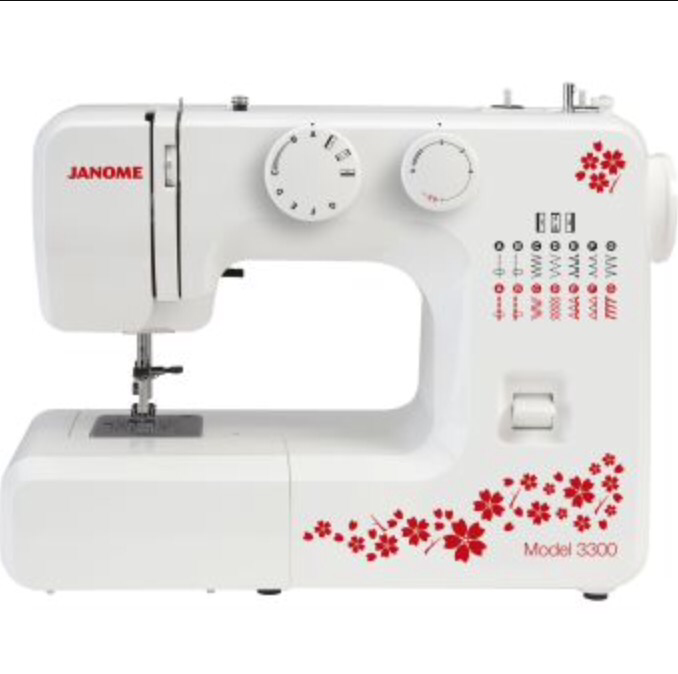 I managed to track down another Janome 3300 to match the other three in my sewing school. They were discontinued (and therefore discounted) at the time, and I could only get three. 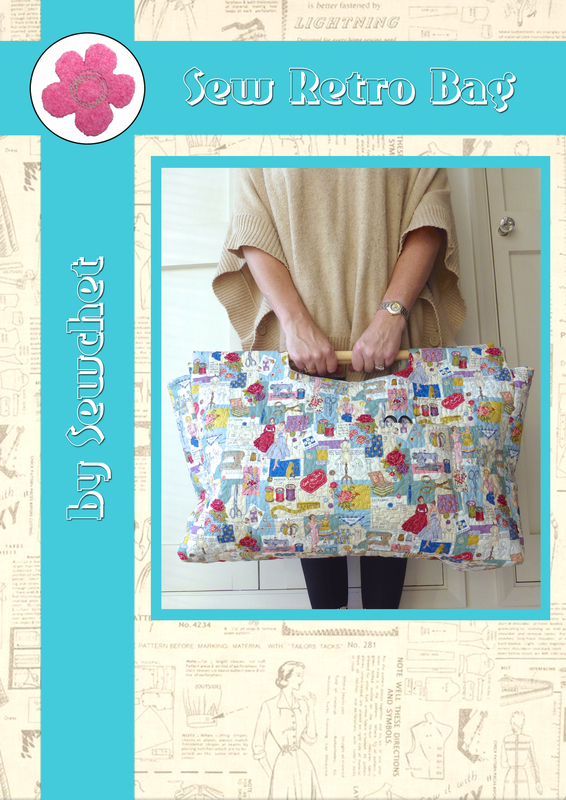 I have been hoicking mine down from my sewing room for each class, which has been a right royal pain in the bum. 6. 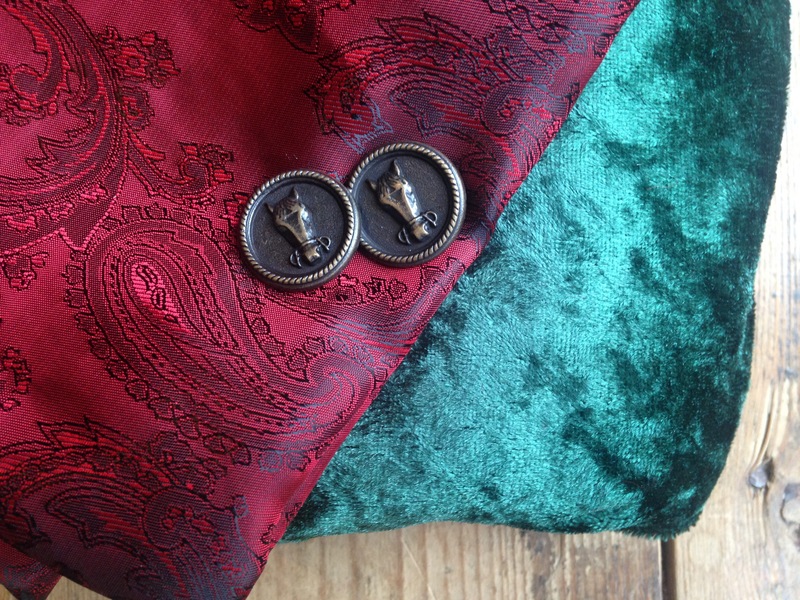 My latest project for the Minerva Crafts Blogger Network – a bottle green crushed velvet coat with dark red Paisley lining and horse head buttons. Nothing run-of-the-mill about this! 7. 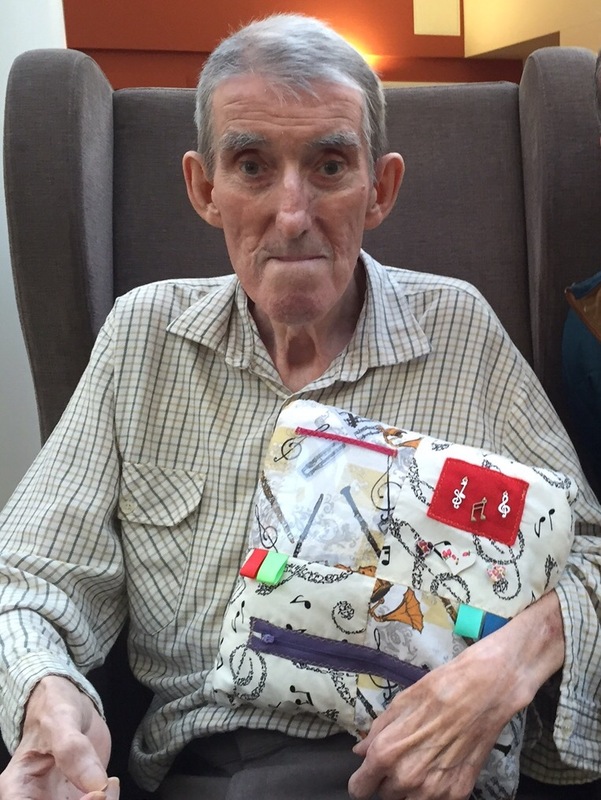 His niece from Hong Kong sent my father-in-law a sensory activity cushion designed for dementia sufferers, specifically tailored to his interests in which music played a huge part. 8. 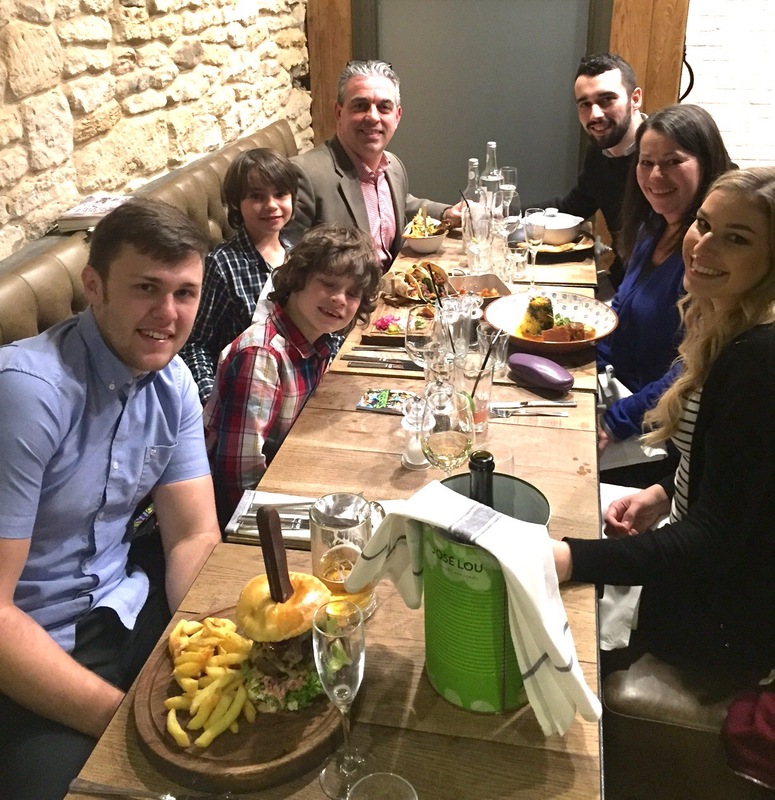 Took the family out for a meal to celebrate No.1 Son’s 23rd birthday (top right with the beard). 9. Daughter’s boyfriend managed to actually eat every last morsel of this ENORMOUS double burger! 10. No.2 Son got tired. 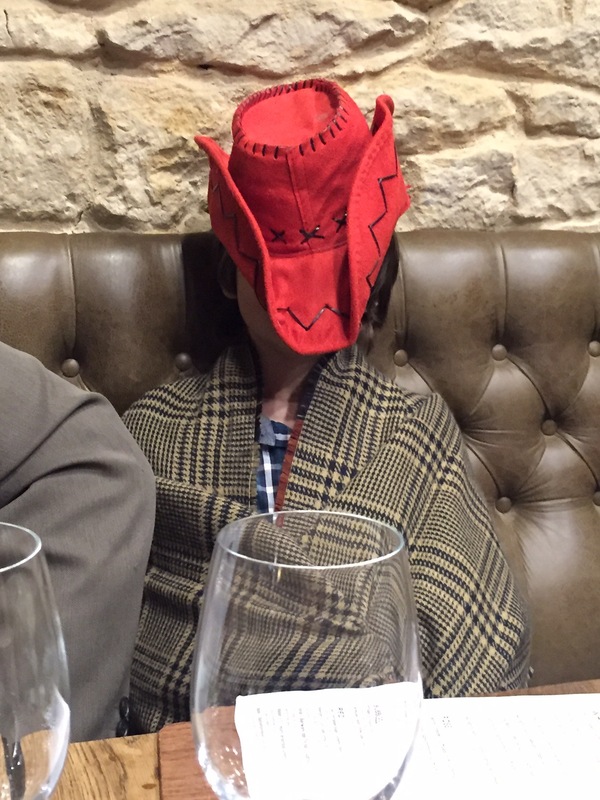 Luckily, daughter was wearing a blanket scarf and N0.3 Son brought his cowboy hat with him. Don’t ask. 11. 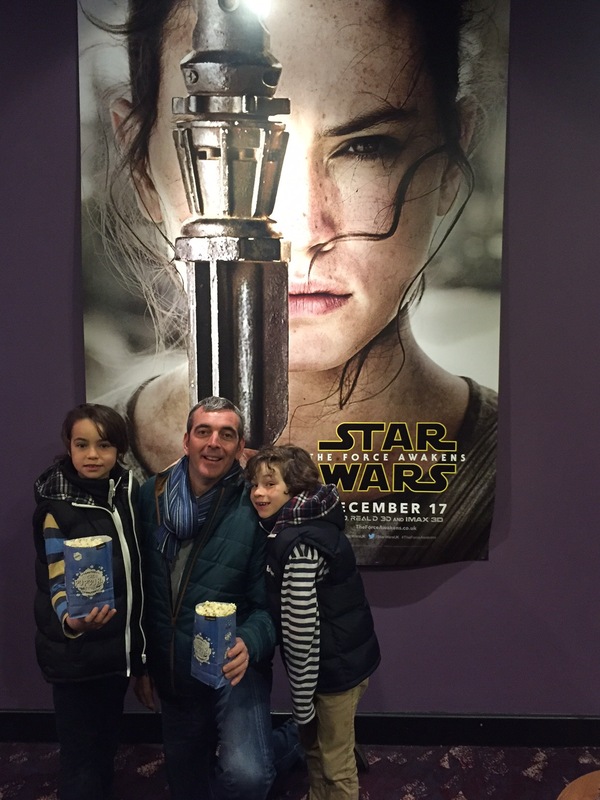 Uncle T was over from France so they all went to watch the latest Star Wars yawn film. 12. 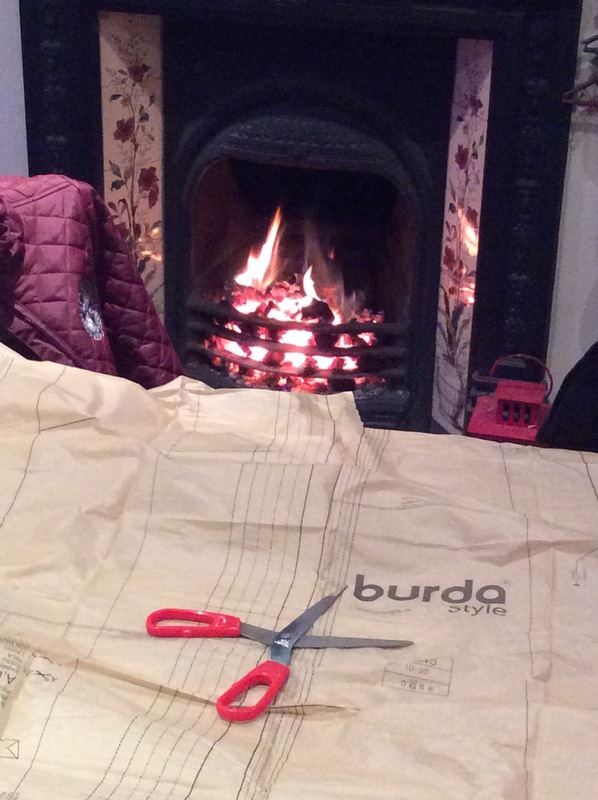 I would rather eat my own liver than suffer even five minutes of Star Wars, so I spent a lovely couple of hours listening to La Traviata whilst cutting out my coat pattern in front of a roaring fire. Heaven! Categories: Sunday Sevens | Tags: bobble hat, Janome 3300, kids can sew, knitting, pom pom, sewing, sewing classes for kids, sewing school, Sundaysevens, Toft | Permalink. That coat looks as if it will be gorgeous! Happy birthday to your son. Thank you, I’m hoping it will be as nice as it appears in my imagination!! I can’t wait to see/read more about that coat! Well, it remains to see whether the reality lives up to my vision, so I’m quite excited in a nervous kind of way, too! Thanks, the hat is finished – I just need to blog it. The Pom Pom looks fab on it! That’s gonna look amazing! Just had a peak! This looks the sort of garment to savour making, and hopefully you’ve not too tight a schedule to work too. Have fun! Lovely photos as always! Gorgeous pom pom and I can’t wait to see the finished coat. Really glad you are now on IG! 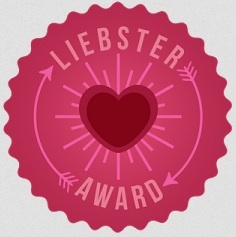 Thanks:) Don’t know how I’ll get on with IG but I’m happy to give it a whirl. I don’t post a great deal but it is quite a good way of keeping in touch with what’s going on. Our southern Sew Bees communicate through an IG group which is useful. Looks like that hat is going to be stunning – I keep thinking how much I would like to learn to knit so an extra impressed with the fabulous things I keep seeing being made. I can’t wait to see how that coat turns out, I wonder what velvet will be like to sew with? Do you get to choose your materials from Minerva, or do you choose what to make based on what they send? Exciting either way! Oh, knitting is just as great as crochet and it means you can pretty much make anything if you can do both and sew as well! Minerva give you a budget and you choose how to use it. I’m using a one way stretch velour with a pattern that calls for non stretch wool! I’m obviously adapting the pattern to suit the fabric, but sewing knits on a machine rather than an overlocker is always more challenging. We shall see…..
Ps- I also opted out of Star Wars and (helpfully!) suggested my husband went with his dad and his brother. Instead I sewed whilst watching Grey’s Anatomy, ha! Any excuse to get in a few extra hours selfish sewing, eh?! Lovely week of celebrating with your family – and belated felicitations to your son! The new coat looks & sounds enchanting, and I didn’t peak at the pattern. Yet. 😉 Your class should love making that blouse! All that cabling on a hat definitely needs a spectacular pom on top. I remember seeing the first Star Wars movie and wondering what all the fuss was about. Haven’t discovered any valid answer, even with Mr. Ford’s presence. Another lovely more than seven photos 🙂 You’ve really set off to a flying start this year 🙂 I too stayed at home while everyone went to see Star Wars. And, although I joined Instagram last year, I’m attempting embracing it this year. Will look you up. Yes, I shouldn’t number them really as it draws attention to the fact that I’m not toeing the line. Not that Nat would mind:) Not sure how IG will go, but will give it my best shot. Trouble is, it’s yet another time-stealing app to keep on top of. 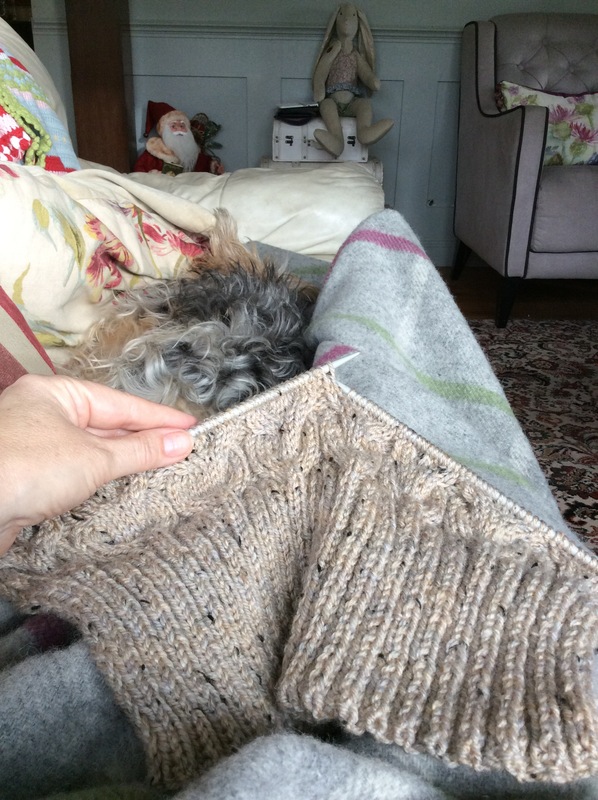 For a moment, I thought that was yarn in the background of your hat knitting photo…then I realised it was your dog! Ha! The hat looks like it will be gorgeous once finished 🙂 I also opted out of Star Wars, I’ve never been interested in them but I’m edging towards watching the others now to see what all the fuss is about! What a great week was had by all. Love the idea of a sensory cushion, that is amazing. You like? It’s coming on a treat and I can’t wait to finish it but seem to have had very little time to just crack on with it this week. No letting up in 2016 then LOL 😉 You seem to be packing more and more in each week! The pom pom is as light as a feather and even softer – it’s almost a shame it’s on top of a hat where it can’t be felt. The girls are starting the blouses tomorrow and are quite excited about it. I love their enthusiasm, it’s quite infectious! Oh, I totally get the Harrison Ford crush, just not the Star Wars thing. I don’t know why I chose those buttons for the coat; I just liked them and thought they were a bit different so I hope they will look OK. We’ll soon see! Can’t wait to see that coat! And the pompom surely must be the softest one ever created, will be lovely on that hat. (Be wary of strangers who’ll be tempted to touch it.) As for Star Wars…..well, we’re Star Trek people around our household. There is a symphony coming in February featuring the music of ST and gave hubby tickets for Christmas gift. Another lovely week you shared with us! Star Wars, Star Trek….loathe them all! However, I LOVE the soundtrack – amazing composing. The symphony will be fab, I’ll bet, what a lovely gift. Aw, thanks Beth, they are a lovely lot, although I probably don’t tell them often enough. My appetite is somewhat smaller than the youngsters. 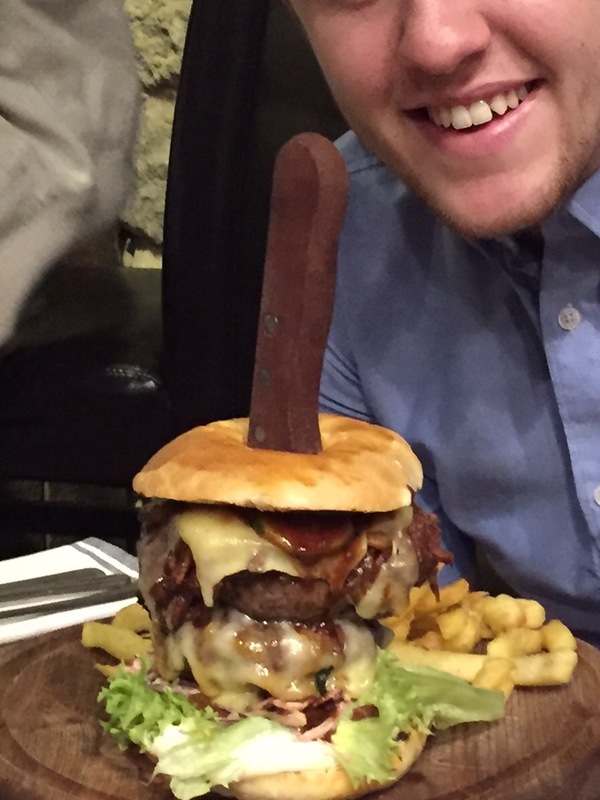 A huge plate of food puts me right off – just looking at that burger made me feel quite sick!